Turning that inner intensity dial down. Stress comes in many forms, from a sudden crisis to the slow drip-drip of life’s daily demands and, whether acute or chronic, the tensions and imbalances it creates within the body, bring a level of intensity to the way we engage with everything. The autonomic nervous system’s stress response (known as ‘fight or flight’) affects the way we experience things. For instance, everything may feel bigger, more important and ‘in your face’, and the imprint of stress remains in our cellular memory and neural pathways long after the crisis has passed. Stress, quite literally, shapes the body and mind, which in turn perpetuates the vicious cycle. We can reduce the effects of stress by learning how to modulate the fight or flight response in our nervous system. A simple way to do this is to become more aware of how we engage our attention and energy in everyday activities, then to turn that ‘inner intensity dial’ down a little. Just taking a step back and softening the level of intensity when we’re engaging in something, (be it thinking, talking on the phone, interacting face to face or working at our computer), allows our nervous system to begin to relax and rebalance itself. There’s another aspect of stress worth looking at if we want to manage our stress levels better. Contemporary psychology tells us a major cause of stress is our own, internal stressor: that inner voice that keeps telling us we “should do better,” “must get things right” or “have to keep going at all costs”. As well as using up vast amounts of nervous energy, this anxiety provoking self-talk prevents us from deep, recuperative rest. At some fundamental level, in order to really rest we need to give ourselves permission to. Internal beliefs usually drive habitual thought and behaviour patterns, so it can be really useful to examine our own beliefs around rest, and explore what gets in the way of allowing ourselves to rest properly. We may need to re-evaluate our relationship with rest: for instance, do we see it as time where nothing useful happens, or do we feel it’s a luxury we don’t deserve? The truth is, rest is the body’s natural growth and repair state and is essential to optimum health and well-being. In order to benefit from rest we need to engage with it fully rather than spending too many of our leisure hours on computer games, networking sites, internet browsing and television. They all tend to stimulate the nervous system rather than allow it to rest fully. Here are some tips to help you use up less nervous energy, manage stress more effectively, and get the most out of your rest. Soften the way you engage with people, ideas and things. Turn that inner intensity dial down again and again throughout your day. Notice every now and then if you are putting more energy than you need into what you are doing. Pause for a moment then put in a third less. Get into the habit of drawing your mind back from being so close up on everything. Let it soften and sit back a little. Regularly step back from situations to get the bigger picture so that you don’t get lost in detail and drama. Learn to set healthy personal boundaries by keeping in touch with what doesn’t feel ‘right’ or comfortable for you. Check in regularly with the set and posture of your body, allow it to re-organise itself (change position, etc) and let the parts of you that were holding tension begin to soften and relax. When resting, really give yourself permission to rest – let every part of you know that it’s ok not ‘to do’ for a while. Ask yourself if you are constantly on-the-go as a distraction from any unmet inner needs you may have, and take appropriate action to address these needs. Build rest time into your daily schedule and commit to it. Recognise the difference between leisure time and rest. Leisure activities can sometimes over-stimulate the nervous system and thus load more pressure on it. It could be said that rest is the absence of stimulation. Learn to listen to what your body is telling you – there may be an underlying feeling of exhaustion that you’ve learnt to override. If you’re feeling ‘wired but tired’ it’s a sure sign you are running on empty and it’s time to stop. 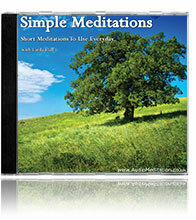 Simple Meditations – Short Meditations to Use Everyday teaches you how to deal with stress, relax, step back and get the bigger picture, concentrate, feel more energized and much more..